If you live in the Ottawa area, and have been meaning to try Arnold Paintball's indoor facility in Montreal, there's never been a better time than this coming December 17th. That's when Carnage Paintball is taking Ottawans on a road trip to the field for an overnight session! 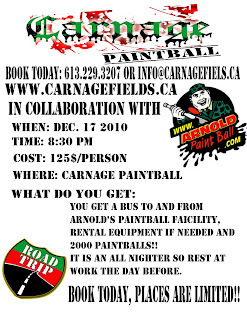 At $125, the trip includes bus transportation to Montreal, admission, rental equipment if needed, and 1 case of 2000 paintballs. This is a golden opportunity for the No Money crowd to try out Arnold Paintball Indoor, as the usual price of a case for non-members is a whopping $210!!! The bus leaves for Montreal at 8:30pm on the Friday night, and returns early Saturday morning, so be sure to rest up in the afternoon (or on the bus on the way over). To register for the trip, or for more information, e-mail info@carnagefields.ca, or reach Charles by phone at (613) 229-3207. I've just received word from Carnage staff that the road trip will be postponed until mid-January. The December date was conflicting with too many Christmas schedules! Stay tuned to Grey Ops for more info as the date approaches.